Holiday home with air conditioning accommodating up six people. 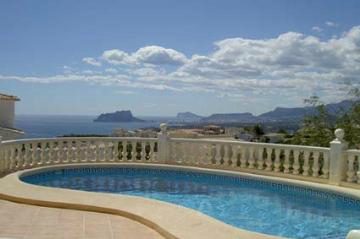 This villa has a private pool which commands stunning sea views from the terrace along with a garden. Located in La Cumbre del Sol which is 8km from the sandy beaches of the Costa Blanca in Spain. The accommodation comprises a living and dining room with fireplace and satellite television. Open-plan, fully equipped kitchen. Double bedroom and two twin bedrooms (2 x 90cm wide beds in each). Bathroom with shower and toilet and a shower room with toilet. The interior is light and airy and the furnishings practical and comfortable. Free internet access. The superb pool terrace allows you to relax in the sun and enjoy the marvellous views of the Mediterranean. There is an outdoor shower, plenty of garden furniture and parking on the grounds. The provision of fully equipped accommodation, water consumption and maintenance of the garden. On arrival: the security deposit = 300 € (in cash). - Possible extras: the rental of the linen kit (sheets, pillow case, towels and tea towels) = 20 € per person per week.